Home is where all of the coolest gadgets live - here are some gift ideas to make your home more awesome. Editor's Note: For the past 16 years Network World has presented its picks of the geekiest, techiest or just plain coolest gadgets for holiday gift giving purposes. We’ve witnessed the birth of the smartphone, the dominance of the tablet and the shrinking size of the television (at least the depth, the width and height keeps getting better). We’ve seen robots, big and small, and every conceivable charger, phone case, travel widget, computer, printer and USB doohickey imaginable. So here we are in 2015 – halfway through the second decade of the new millennium (does anyone use that term anymore?). We live in a world of instant news and social recommendations via Twitter, Facebook, YouTube, Instagram, Snapchat and countless other communication platforms. Most of your holiday shopping will be done this year online – whether it’s Amazon and other mega-shopping sites, or just the online site of your favorite retailer, depending on whether they’re offering free shipping or not. Black Friday and Cyber Monday are national holidays. There’s so much stuff out there and so many ways to buy that stuff that it’s no wonder that people freak out at the holidays. Can we help you sort through the madness? Hell, no – that would be a full time job here at the Cool Yule Tools Headquarters, and we’re really busy fending off pushy PR people who insist that their iPhone 6S case is absolutely the perfect gift guide item (and in one case, it was, since it also could charge our phone). But what we can do is offer up our humble list of products and technologies that may impress someone on your holiday gift list. Some of the stuff is ultra-techie and ultra-geeky, some of the stuff you may look at and go, “what kind of gift is that?”. Quite simply, it’s stuff we’ve tried out this year, stuff we’ve liked, or stuff that we think can help you (or someone you know) live a better life in this crazy, tech-obsessed culture. This article highlights our picks for gift items meant for "HOME" - while you could certainly use these items at work, or in your free time (when you're playing), we feel these are best utilized in the comfort of those four (or more) walls you call your living space. The PictureMate line of photo printers has been around for several years, back when digital cameras were separate devices and people still enjoyed printing out their photos to look at (or store in photo albums, put in frames or post to a bulletin board). Since then, our main camera is now on our smartphone, we’re uploading images and sharing them via Facebook, Instagram and Twitter. Yet the photo printer hasn’t vanished – in our lives there are still many times when we would like to have (or might need) a printed photo. For example, my daughter’s first-grade teacher requested that all of the students come in with a photo of something that they did during summer vacation. Or you want to show off a cool photo of your kids to your co-workers without having to scroll through your phone’s photo album (on the off-chance that there are some other images on the device that you don’t want them to see – wink, wink, nudge, nudge). Luckily, the PictureMate PM-400 has updated its features to be compatible with the latest ways that consumers are taking and storing their digital images. The printer can now print 4-by-6 and 5-by-7 images -- earlier models could only do the smaller size. 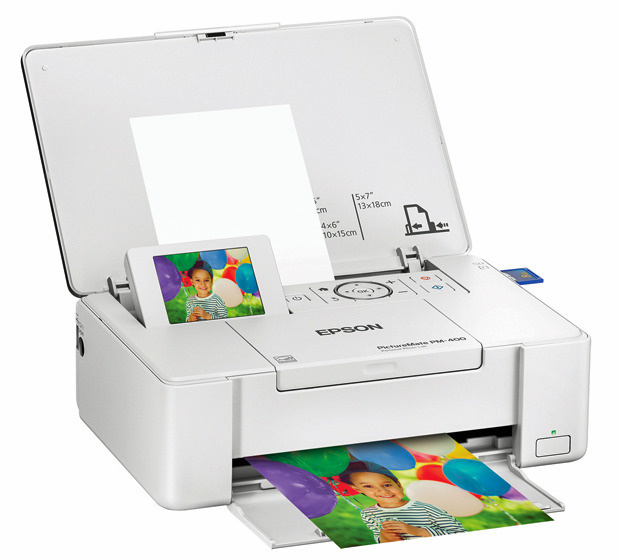 You can print images by inserting an SD memory card into the side slot of the printer and selecting them via the pop-up LCD screen (owners of other EPSON printers will recognize the display). In addition to printing color images (via a very cool Print Pack that includes an ink cartridge and paper), settings allow you to print images in black-and-white or sepia tone, with or without borders. The printer can be connected in several ways – you can go old-school and connect a USB cable (sold separately) to a computer; more likely you’ll want to connect this to an available Wi-Fi network (one small downside – typing in a long password via the LCD screen can be a bit tedious). If Wi-Fi’s not your thing, you can print directly from a mobile device to the PM-400 via Wi-Fi Direct. For the most part, connecting via an existing Wi-Fi network is likely the easiest method for setup, as you can then print via your computer and mobile device (smartphone or tablet) without too much difficulty. This setup also lets you use an Epson app to print photos stored on your mobile device, a quick and easy way to get those photos off the phone and into a more semi-permanent state of being. The portability of the device is also key – it’s small enough where you can take this with you to parties, gatherings or other locations for an instant photo-printing-like studio. 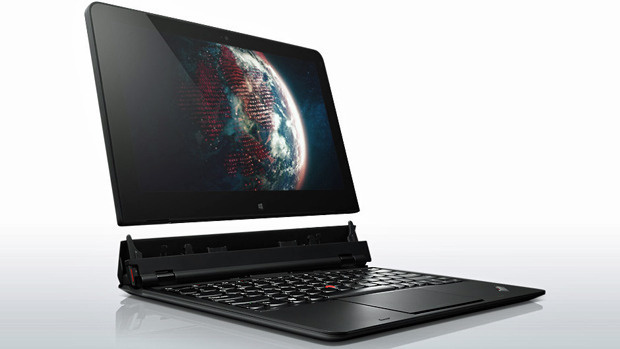 If you’re trying to figure out if you should gift a laptop or a tablet, the ThinkPad Helix offers you the best of both worlds. As a tablet, you get a Windows tablet experience (in my test I upgraded to Windows 10 from Windows 8.1), complete with an 11.6-inch display and touchscreen functionality. When you add the keyboard attachment, you get the benefits of a notebook, which is very nice and solid – it doesn’t feel like a typical tablet add-on keyboard. Most people looking at the device from this combination will just assume you have a very light notebook. The system comes complete with good specifications – Up to Intel Core M 5Y71 processor, up to 256GB Solid State Drive, either 4GB or 8GB of RAM, as well as a couple of cameras (front and back). I liked the flexibility of this device – you can bring it along during a trip and use the tablet if you want to read a book, play a game or watch a movie. Then when the boss calls asking you to get some work done, you can attach the keyboard and answer the email, finish that spreadsheet or write up a gift guide review. I never realized how much I’d appreciate the location of power outlets in my home until I started acquiring multiple smart devices such as phones, tablets and other assorted gadgets. Compounding the issue is the rest of my family, who drain their device’s batteries quicker than you’d expect. Until now, we’ve relied on multiple power strips along with its tangled, jumbled mess of cables, docking stations and other devices (see previous gift guides for some of those solutions). What I love about the SnapPower Charger is that you can add at least one USB power port to each of your home’s power outlets. These very cool cover plates draw power from the screws on the side of your outlet (after you unplug existing cover plates), giving you enough juice to power up a single device. Installation is relatively simple – unscrew old plate, attach new one and re-screw in. There are some possible complications, such as if you have an outlet that has an obstruction inside it (one outlet I tried had screws that weren’t completely screwed in), but the instructions come with some possible solutions (including, “call an electrician”). While this won’t completely solve our power issue, it does alleviate the problem somewhat. Now, for example, a child whose tablet has run out of juice can continue to operate it if they just plug in a power cable to the outlet that includes the PowerCharger (of course, having a device’s battery die is a good excuse to go tell them to go do something else). Also, be sure to check out SnapPower’s other cover plate design, which includes three small LED lights that can act as a night light, eliminating the need for a separate night device and freeing up an additional outlet. 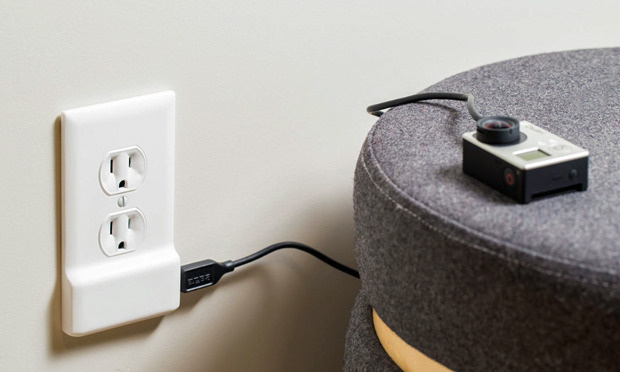 One other quick thought – be sure to have extra USB charging cables that you’ll want to use with the Power Charger – since most outlets in the home will be hidden by furniture, etc., it’s probably easier to have a charger permanently attached to the USB port. 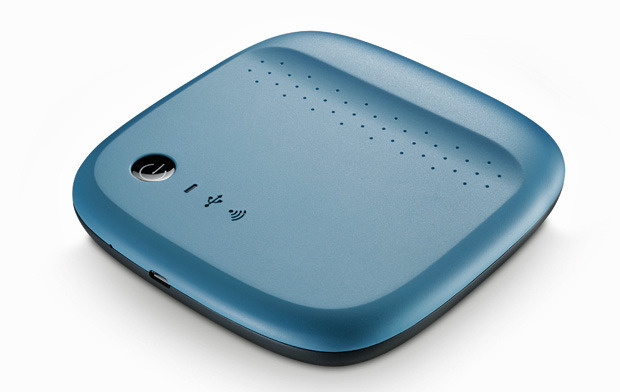 The latest version of the Seagate Wireless portable hard drive makes some improvements from previous years (extra capacity, for example), but the basics are still there. It lets you store data on the go and then stream it via its own Wi-Fi connection to portable devices (phones, tablets, etc.) with its own Seagate Media app. This is the perfect device for taking multimedia content (photos, videos, music) along with you, especially for those all-important road trips with the family. Setup is easy – just plug the included USB cable to the Wireless drive and copy your files directly from a PC or Mac. When the drive is portable, turn on the Wi-Fi for the unit (by pressing the power button down a few seconds), and then connect with the mobile device through its Wi-Fi settings. Then, with the Seagate Media app, you can view or listen to the files stored on the drive. It helps if you have a travel charger that can plug into your vehicle’s car charger port – Seagate promises up to 6 hours of usage time, but it’s always easier to just keep it plugged in via the charger adapter. We used this drive on a recent across-two-states vacation, and the kids in the back seats were able to watch their favorite TV shows and movies and music on their iPods and iPads. 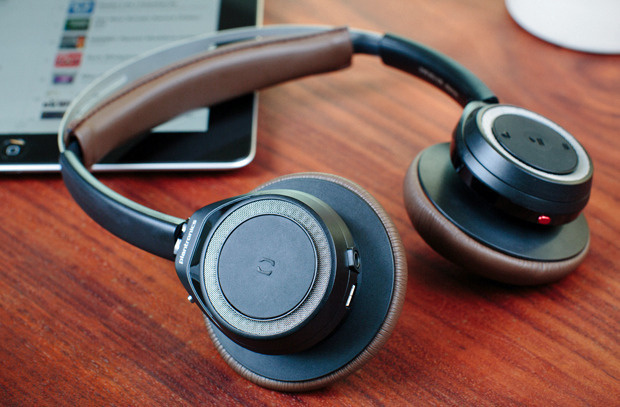 The BackBeat series of headphones from Plantronics gets a new sibling, joining the BackBeat Fit (workout Bluetooth earbuds) and BackBeat Pro (heavy-duty over-the-ear headphones) models. The Sense headphones are meant to be in between these two models – for those times when you want lightweight headphones for listening while on the go, but not those that need sweat protection (in other words, you’re just walking around instead of doing a heavy duty workout). These remind me a bit of some old-school headphones you used to get in the 1980s when the Sony Walkman first came out, but with a lot better design and comfort. Two bars on the top provide a perfect fit for your head, with a softer bar touching your head/hair, and memory foam earpads that feel great. The coolest part of these headphones is the smart sensors – when you take the headphones off your ears, the music you’re listening to pauses. When you put them back on, the music starts again. You can also play/pause manually by pressing buttons on the left earpad. Another cool feature – the earpads swivel to let you rest them comfortably around your neck when you’re not using them. The system provides two Bluetooth connections with the ability to switch between them (one for your iPod, one for your phone? ), and a full charge promises up to 18 hours of battery life – if you do happen to run out of power, the headphones come with a wired audio cable. The headphones also come with a dual-pocket storage sleeve, which lets you store the audio cable and charging cable in one pocket, and the headphones in the other pocket. If you’ve been enamored with the Microsoft Surface Pro 4 and have thought, “Wow, I’d really like one of those, but not at the $1,000-plus price tag ($899 base model plus extra for the keyboard attachment), take a look at this version from Acer. While not quite the same as the official Microsoft device, it’s close enough with its specs to provide you a similar experience. 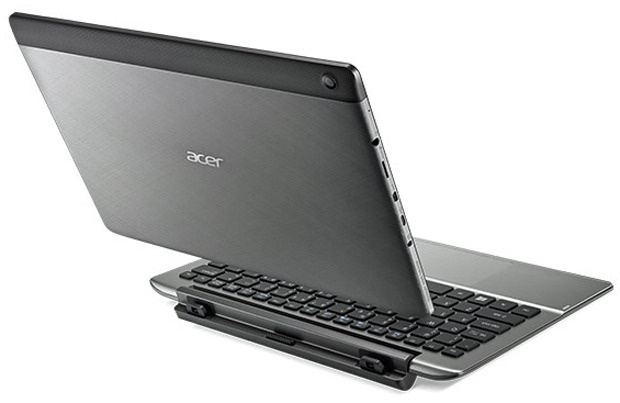 The 2-in-1 hybrid combines a tablet (touch screen, Windows 10 tablet mode) and a notebook experience (turns into a regular desktop when attached to the included keyboard). The system we tested included Windows 10 Home Edition pre-installed, an Intel Core M processor (800 MHz, dual-core), 4GB of RAM and a 128GB solid-state drive. The 11.6-inch display supported full HD (1,920 by 1,080) resolution (a lower resolution is available for about $100 less). If you want to add a stylus, that’s an option (for $29.99) as well. It’s certainly a usable notebook – I preferred the solid feel of the keyboard compared with the softer keyboard option from Microsoft – but that will mean some extra weight to the overall package. When used in tablet mode, the back gets a little warmer than I’d like it to get, but you get that with lots of tablets. The extra apps that Acer provides (abDocs and abPhoto were the ones that showed up on my desktop) might be interesting, but you’ll likely delete those and use your own preferred apps. Other features being touted by Acer for this device include LumiFlex (optimize screen visibility during outdoor usage); In-plane switching (colors remaining true across all viewing angles); and VisionCare (optimizing display output in bright light). I also wasn’t a fan of the touchpad, opting to add a USB mouse when I was in notebook mode. I enjoyed using this model during my tests, and it would make for a great gift if you have someone who is itching for a Surface but you don’t want to pay the extra money for basically the same product.